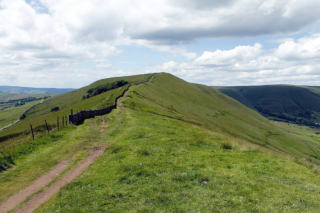 This is a circular walk using the southern hills for fantastic views into the Hope Valley & Castleton, and Rushup Edge (see photo) via the south west rim of the top of Winnats Pass to Mam Tor to witness the spectacular views of the Edale and Hope Valleys. Do bring your camera/phone for the panaramas. Walk 1 utilises the section of Rushup Edge to Loose Hill, and Walk 2 (Thursday Sept 20th-Jacob's Ladder/Rushup Edge) utilises the section from Mam Tor west to Edale Head including the ascent of Jacob's Ladder from Barber Booth again witnessing the splendid views into the Edale Valley. Route: Walking south through old Castleton, up Pindale Rd towards Pin Dale to gain height and access to the south hills. Turning west along the hills across Cave Dale (with views into the Roman castle-hence Castle town evolving into Castleton), continuing in the direction of Winnats Pass - a dramatic limestone valley. A short scramble will then lead us to a lesser known route along the top most southern rim of Winnats Pass to get unrivalled views down into Winnats Pass. (Depending on progress we could have lunch here or at the top of Mam Tor). From the top of the pass (Winnnats Head Farm), head across to the bottom of Mam Tor ascending via the south west route (517m). Along Rushup Edge to Hollins Cross (426m) Black Tor ((391) to Loose Hill (476m).Descent is via field and public footpaths back into the centre of Castleton where there are many excellent real ale pubs with hot food. Suggested Driving Route: to avoid congestion via the Glossop route and M56 Knutsford route. M53/M56/M60 J27 Bredbury/Marple. Take 3rd exit St Mary's Way from the roundabout. Thro' 1st set of lights and left at the 2nd set of lights (Hall Street A626). This leads into Offerton Lane (A626) and leads into Stockport Rd. This in turn leads into Strines Rd which continues into Low Hague and then Hague Bar Rd. Past the 1st of 2 railway stations (RHS New Mills Central) in New Mills. (Basically you will need to stay on this road via bends from Hall St all the way to New Mills- thro' the 3 sets of traffic lights in Marple). The car park costs £5.20.